In the industrial revolution the steam engine was invented then they invented a steam locomotive then it lead to the electric powered train. 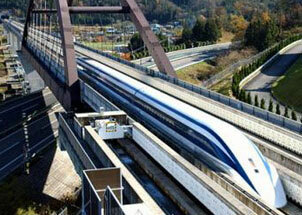 In the 1960s, Great Britain held the lead in magnetic, developed a functional maglev passenger vehicle. It weighed 1 ton and could carry four passengers. Additional funding for his work was also provided by British Rail, the British Transport Commission, Manchester University, Surrey University and the Wolfson Foundation. His maglev had one mile (1.6 km) of track and was thoroughly tested, but his research was cut off in 1973 due to lack of funding; and his progress was not sufficient. British Rail also set up a Maglev Experimental Centre at their Railway Technical Centre based at Derby. In the 1970s, Germany and Japan also began research and after some failures both nations developed mature technologies in the 1990s.